Picture the scene: you receive a Spotify URI from a friend. It looks something like spotify:track:69GFzoDcAFrW6CD5tBEMTK and your computer doesn’t linkify it. So to discover the music, you’ve got to select all, copy to clipboard, switch to the Spotify app, focus the search box, paste and hit ENTER. Well not any more you don’t. -- As this is run via Automator with "service receives text in any application"
-- we don't need to do anything to copy from the clipboard. -- whether it looks like one, and if so, tell Spotify to play it. -- If we're good to go, go! -- Remove cruft from the end of the selected text. 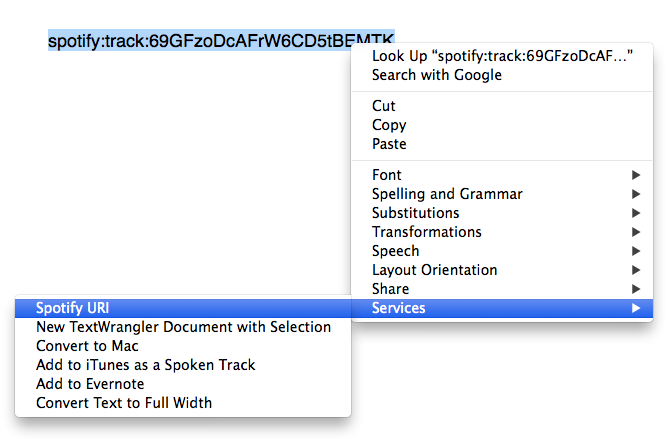 A nice side-effect of this exercise is that it works for both spotify: Spotify URIs and http://open.spotify.com/ HTTP Links. Applications such as Skype automatically linkify HTTP URLs and clicking them opens the web player – irritating if you’re using the desktop application. Now, the same workflow (highlight, context menu, run script) will work for both. So far I’ve tested with links to tracks, albums and playlists and they all work just fine. This was done on Mac OS X 10.9.4. This entry was posted in AppleScript, Development, Music and tagged HTTP Link, Spotify, Spotify URI by Stuart. Bookmark the permalink.